Karim Sy is the founder of Jokkolabs. Of Malian and Lebanese heritage, Karim launched the innovation hub in 2010. Jokko is a combination of the Wolof words Joxho meaning ‘give them’ and Jotko meaning ‘join them’. Jokkolabs is a network of co-working spaces, creative hubs and entrepreneurs, who all share values of openness and sharing. 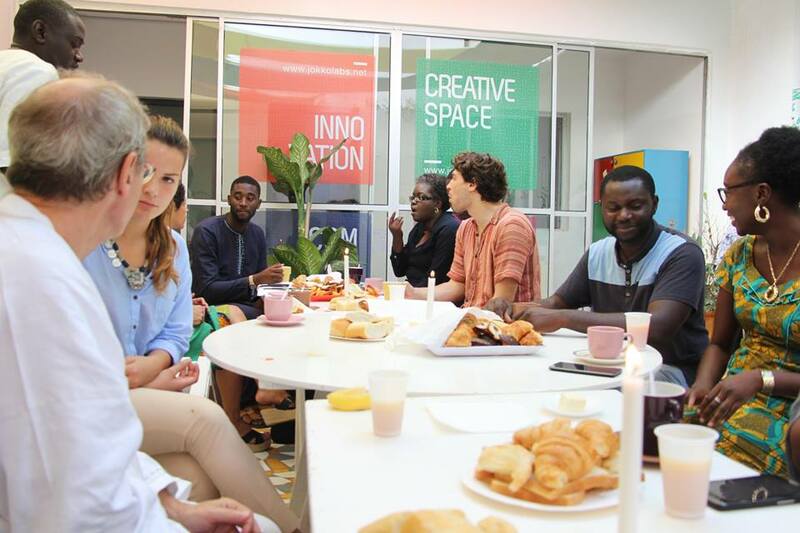 The initiative encourages and supports open-source innovation in Senegal and Africa as a whole. Jokkolabs has co-working spaces in a range of African cities including Cotonou, Casablanca, Dakar and Banjul. They’ve even now opened in Nanterre in France. How was Jokkolabs able to grow so much in the last couple of years? At first, Jokkolabs was just a vision, a way to expand on my entrepreneurial experience. I had become an entrepreneur really early on at the age of 19 years old, when I was studying at the École Polytechnique de Montréal. When I returned to Africa, I got involved in all kinds of different businesses, including in the tech space. This was happening just as everyone was thinking about what future societies could look like. I had also worked with the United Nations on issues related to competitiveness, trade and export markets as well as with the Senegalese ministry of foreign affairs in the Netherlands – as a donor. So I saw how governments were dealing with those issues and how little they understood about the new digital economies that were emerging. I had a feeling that Jokkolabs could help foster new forms of active citizenship. At the same time, I knew that these digital economies would amount to a great opportunity for African countries, so in 2010 I stopped everything I was doing as an entrepreneur because I wanted to focus on launching Jokkolabs as a space for enabling creativity and social change as well as creating a global community of collaborative entrepreneurs. They would invent the future for a shared prosperity. I had a feeling that Jokkolabs could help foster new forms of active citizenship, by creating things that had never existed before, around a real culture of entrepreneurship. Pretty quickly everyone saw us as a tech hub, as an incubator, although we always wanted to be much more than that. We want to be part of the solution for issues that face the world today. Everyone is always expecting us to say that we found the next Facebook, but it’s not about that. By the time we started looking at new forms of agriculture and collaborating with Senegalese companies like La Laiterie du Berger, which works with livestock herders and finds better ways to produce milk in Africa, it had become all about shared value and shared prosperity. This was not just in the tech space. Nutrition, health and agriculture are important too. Can you give us an example of a Jokkolabs company that you consider to be a success story? Everyone is always expecting us to say that we found the next Facebook but it’s not about that. I always hear so much hype around certain tech companies that the media loves. I see the entrepreneurs behind those companies winning prizes and hopping from one podium to the next. I am much more interested in companies like Dakar-based agency 3W, which is specialised in digital communications, and focused on understanding how Africans interact on social networks. 3W created a gaming platform for Facebook, the web and mobile. It’s called Wizili. I find it really interesting because it is another example of a frugal innovation that can be nicely adapted to all emerging markets. It is an innovation that can be useful to small and medium-sized African, EU and US enterprises. And 3W is creating jobs right in Dakar and working all over Francophone Africa. When you consider the fact that 60 per cent of Senegalese companies go bust within a year, doing what 3W have done is no small achievement. Baila Ndiaye, he engineered and built a car in the technical school of Thiès, the third largest city in Senegal. And he did it entirely with recycled materials. He is a chemist, not even a mechanical engineer, yet his car can reach a speed of up to 100 kilometres per hour. You wonder how he was able to imagine such a machine. He’s said he also wants to build a tractor and a plane. So there you have it: African inventors with great ideas who need nothing more than to be taken seriously. People like Baila Ndiaye are the reason we have become active in the maker movement.